The I-O 2677e is an economical 5250 Ethernet display designed for IBM Power System, i5, iSeries, and AS/400 data entry via TCP/IP. Compared to PC workstations, the 2677e is a low-priced, low-maintenance solution that provides a high level of productivity and performance. 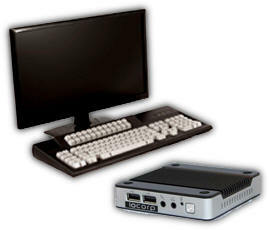 With an optional 122-Key Keyboard, the move from a Twinax Terminal to an Ethernet-based terminal will be a simple one. Low Cost Low initial cost and less expensive to maintain and support than a PC. Record/Playback Up to 1500 repetitive keystrokes can be recorded in a single function key (24 function keys available). IBM-style 122-key 24 Command Key Keyboard Layout IBM System i, i5, iSeries, and AS/400 compatible with fast and easy input. Host Addressable Printer Port Native host print jobs can be sent to the USB port via TCP/IP. Full Featured 5250 Display Multiple Display Sessions. 80 and 132 column display, multi-host support, record/playback, and rule cursor. I-Os Award-Winning Printer Emulations 3812/4214 emulations with page range printing, error reporting, and fast first page out. VESA Mounting Capable Requires minimal desk space. 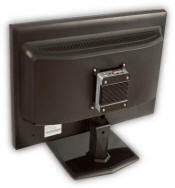 LCD mounting hardware included (see image below). Easy to Configure User set-up is simple and easy using either local or remote configuration. Sessions are auto configured on the host. The 2677e is a full featured 5250 /3270 Ethernet Terminal that includes multiple display sessions and host addressable printer session. The display can be 80 or 132 column mode, and multi-host support. It has an available 122-key IBM Terminal style keyboard. Your users will be instantly familiar with the layout making the move from legacy Twinax or Coax "green screen". This eliminates the errors when you give them a new keyboard layout they are not familiar with. The 2677e has a host addressable printer port (USB) that allows native IBM Host print jobs to be printed in an Ethernet environment. Host print jobs are not lost in the “black hole” of network printing. With the 2677e, users have the flexibility and control of page range printing, error reporting, and faster printing speeds. For years, I-O Corporation has been a pioneer in developing display stations for the IBM midrange market. The I-O 2677e offers a 122-key keyboard that is fully AS/400 - iSeries compatible. The I-O keyboard has the same feel, command keys, and layout used in traditional 5250 keyboards that makes data entry fast and easy. Since 1977, I-O Corporation has been a pioneer in developing IBM midrange solutions. In addition to I-O’s well-known display technology, the 2677e incorporates I-O’s award winning IBM host printer emulations. The I-O 2677e is the right choice for those dedicated to IBM host data processing. 3-year warranty on logic unit and keyboard.